as you will be aware, last week Russia and China vetoed a proposed UN Security Council resolution on Syria, the fourth time this has happened. 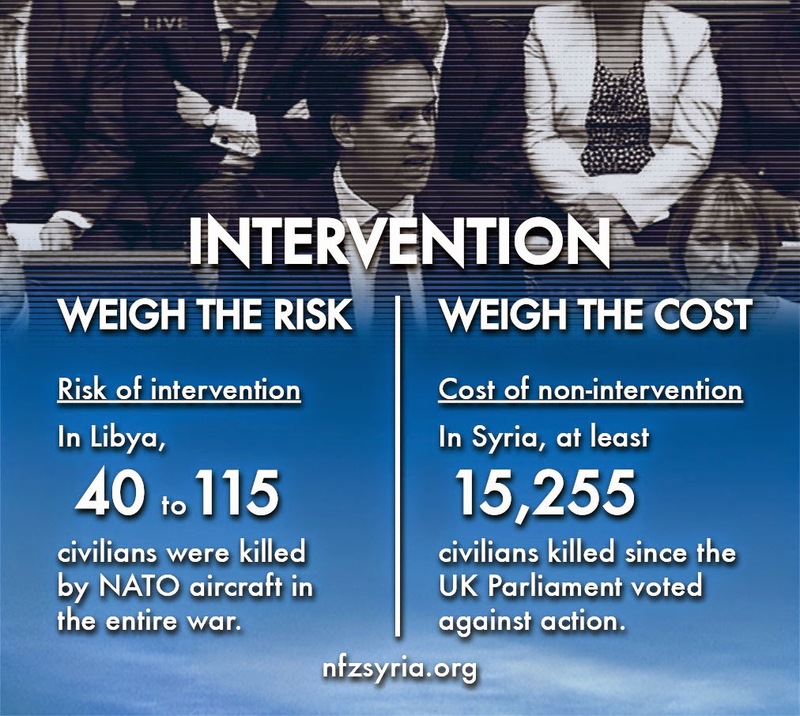 You may also be aware that since the House of Commons debate of 29 August 2013, the Violations Documentation Center in Syria has recorded a further 24,674 individuals killed, of which 15,670 were civilians, of which 4,939 were civilians killed by air strikes. As counts of verified deaths only, these are necessarily undercounts of the true totals. 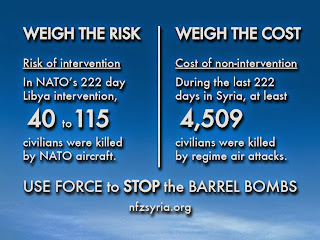 You may be aware of how comparatively low the risk to civilians would be in an intervention against the Syrian Air Force, of how in the Libyan intervention, NATO strikes against air force, army, and navy targets, caused the deaths of between 40 and 115 civilians according to Human Rights Watch and Amnesty, too high a number, but a fraction of the number of civilians killed weekly in Syria. 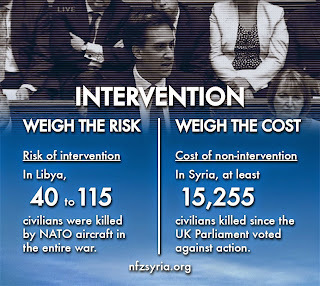 You may remember that the intervention to protect civilians in Libya lasted just 222 days before major hostilities ceased, and note that it is now 273 days since the House of Commons turned away from further consideration of intervention in Syria. I have been re-reading your remarks from last August’s House of Commons debate following the Ghouta chemical weapons attack, and considering what you said then in the light of last week’s UNSC veto and other recent developments. The weapons inspectors’ report was subsequently delivered, and it confirmed in detail the use of chemical weapons in the Ghouta attack. Evidence has since been published showing the attack was carried out with ‘Volcano’ rockets used only by the forces of the Syrian Government, that the volume of Sarin used was such as to require a large scale CW programme out of the reach of any party to the conflict other than the Syrian Government, and that the attack left residue of hexamine, an unusual chemical in a CW context, but one included in the Syrian Government’s declared CW stockpile. Subsequently the UN Security Council passed Resolution 2118, following the Russia-US deal on eliminating Syria’s chemical weapons and Syria’s accession to the Chemical Weapons Convention. As well as delaying disposal of its declared CW programme, the Syrian Government has reportedly carried out several more chemical weapons attacks in the past couple of months, using chlorine rather than Sarin; these attacks breach Resolution 2118, they breach the Chemical Weapons Convention, and in common with all bombing of civilian areas by the regime they breach February’s Resolution 2139, and they breach international humanitarian law. Having now seen Russia and China exercise their UNSC veto four times over Syria, it is no longer possible to imagine passage of a Chapter VII resolution. You made clear in August that you agree with the UK Government position on the legality under certain circumstances of military intervention without a Chapter VII resolution, the criteria being: convincing evidence of extreme humanitarian distress; no practicable alternative to force; and that the proposed use of force is necessary and proportionate to the aim (relief of the humanitarian need) and is strictly limited in time and scope to this aim. Regarding evidence of extreme humanitarian distress, this is overwhelming. Regarding the requirement that the use of force be necessary, proportionate, and limited in time and scope, this properly limits the action that may be taken, however I believe the demand in the proposed Labour amendment to define a time limit in advance went beyond the requirement in the Government legal advice. The legal advice does not imply that a strict timetable be set out in advance, but only that action must not continue longer than is necessary to achieve the aim. In a complex military conflict this is rarely if ever something that can be predicted to the day, and the better path for political leaders is to clearly limit the aim rather than to try and predetermine and publicise a date for its completion before action is even begun. This argument is fatally flawed. Its flaw is the same glaring flaw that runs through the entire debate on chemical weapons use in Syria, namely that only a fraction of the victims of the conflict are victims of chemical weapons attacks. Elsewhere in your remarks you argued that Britain should not follow “an artificial timetable or a political timetable set elsewhere.” In limiting the debate on intervention to the issue of chemical weapons, British political leaders on all sides have allowed themselves to be constrained not by an artificial timetable but by an artificial agenda, a political agenda set not by any British leader but by the US President. It is much overdue for Britain’s political leaders on all sides to publicly recognise that the debate on intervention in Syria must not be limited to the issue of chemical weapons. It is also well past time to publicly recognise that the legal conditions for military action have been met, that the Syrian Government has turned its back on a diplomatic solution and is daily in deliberate breach of UNSCR resolutions, the CWC, and international humanitarian law. It is well past time to publicly recognise that the risks in taking action are overwhelmingly outweighed by the scale of humanitarian distress, and that the scale of killing and maiming of civilians by the Syrian Air Force alone has long justified intervention to degrade and destroy their military capacity. It is well past time to recognise that allowing the current situation to continue undermines the credibility of international law, undermines the credibility of the UN, and undermines the credibility of the UK as a permanent member of the UNSC. It also undermines the credibility of the Labour Party as one of the authors of the current situation through the August vote. It is well past time to live up to your own words that the Syrian humanitarian issue “transcends party politics,” words that demand you work for cross-party unity in countering the Syrian Government’s campaign of mass-slaughter in defiance of international law. 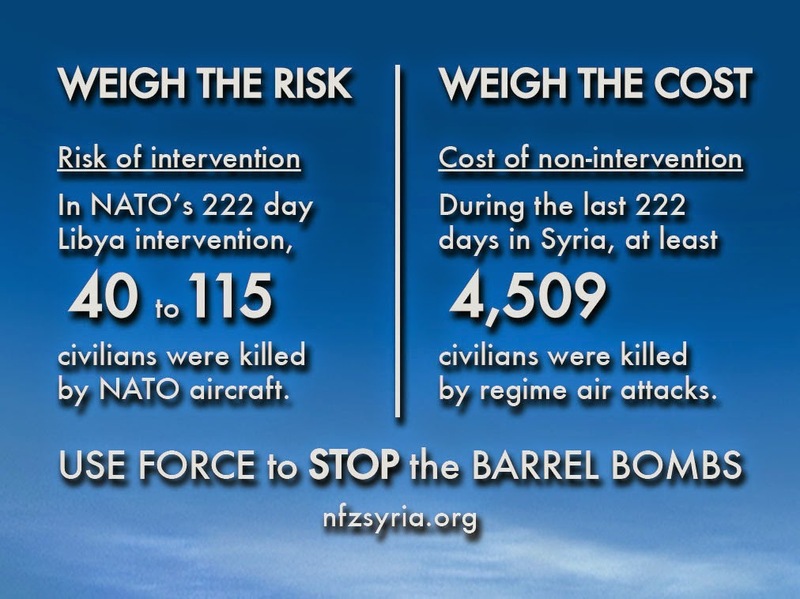 Read more: Stop the barrel bombs – A moral and legal responsibility to use force. Libya sources: The New York Times, Human Rights Watch, Amnesty International. 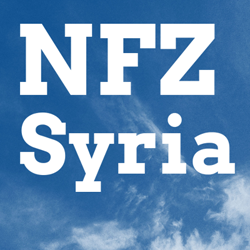 Syria source: Violations Documentation Center in Syria. Via UN Web TV, a special event yesterday organised by the Permanent Mission of the Netherlands and co-sponsored by the Permanent Missions of Belgium, Denmark, France, Germany, the United Kingdom, Luxembourg, Portugal, Qatar, Saudi Arabia, Spain, Turkey and the United States. Introduced by the Permanent Representative of the Kingdom of the Netherlands to the UN, H.E. Mr. Karel J.G. van Oosterom, the event includes a five minute compilation of videos of barrel bomb attacks, witnesses’ testimonies from Dr Samer Attar, a Syrian American Medical Society physician and from Ibrahim al-Assil, a member of Syrian Nonviolence Movement, and a Human Rights Watch presentation by Peggy Hicks. Scepticism is wholly to be welcomed and is based on evidence, investigation and critical thinking. Cynicism is a posture. It is a generalised mocking stance, one that is inherently conservative. That might sound odd, cynicism often has a radical sound. Yet it answers the question, ‘what can we do’ with one word: ‘nothing’. It is a recipe for paralysis and posing.